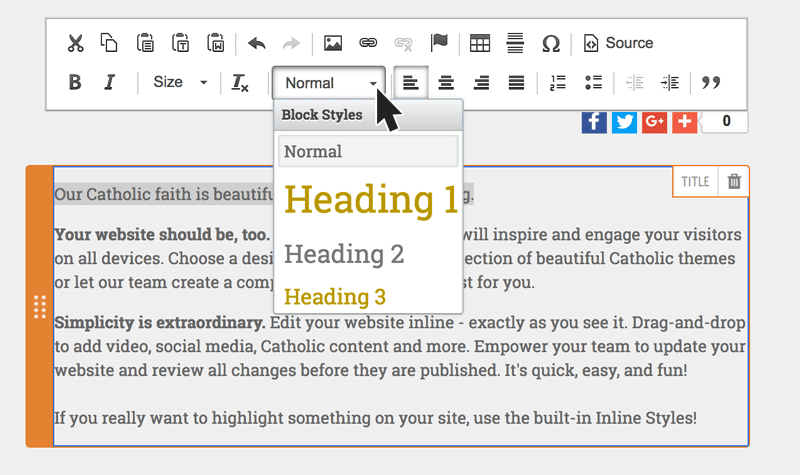 Each eCatholic theme is built to include easy-to-use formatting tools. These tools give you some creative flexibility and also help you maintain consistency in the fonts and colors that appear on your site. Using these formatting options consistently throughout your site is an easy way to make your website look clean and professional! Each free theme has a set of built-in Block Styles that you can use to format your text. To access these options, just drag and drop a Text/HTML module onto a page, add some text, then click inside the module to make the WYSIWYG toolbar appear. Next, highlight a portion of the text and click the Formatting Styles drop-down menu (as illustrated below) to access the different Block Styles. Each free theme also includes a set of Inline Styles you can use. These are pre-built font colors that match your website's theme and color palette. To access these options, just drag and drop a Text/HTML module onto a page, add some text, then click inside the module to make the WYSIWYG toolbar appear. 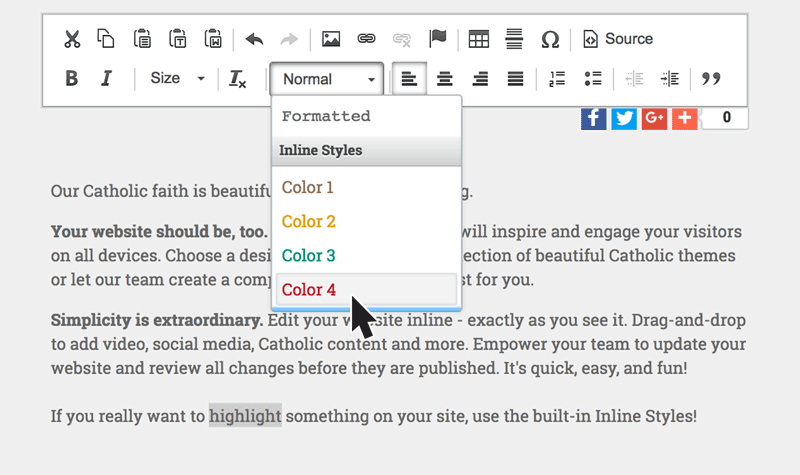 Next, highlight a portion of the text and click the Formatting Styles drop-down menu (as illustrated below) to access the different Inline Styles. Proceed to apply the Inline Style as described above. Click the Block Quote button to format your text to feature quotes in a unique way. Each theme includes its own special Block Quote styling.